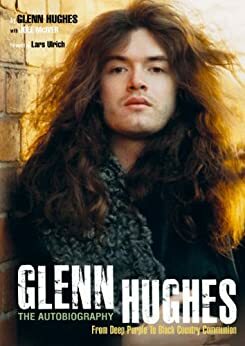 Glenn Hughes: The Autobiography - Kindle edition by Glenn Hughes, Joel McIver, Lars Ulrich. Arts & Photography Kindle eBooks @ Amazon.com. Vocalist, bassist and songwriter Glenn Hughes is a living, breathing personification of British rock, and the arc of his career and attendant lifestyle make for a compelling story. Starting with the Midlands beat combo Finders Keepers in the 1960s, he formed acclaimed funk-rock band Trapeze in the early 70s before joining Deep Purple at their commercial peak. Flying the world in Starship 1, the bands own Boeing 720 jet, Hughes enthusiastically embraced the rock superstar s lifestyle while playing on three Purple albums, including the classic Burn. When the band split in 1976 Hughes embarked on a breakneck run of solo albums, collaborations and even a brief, chaotic spell fronting Black Sabbath. All of this was accompanied by cocaine psychosis, crack addiction and other excesses, before Hughes survived a clean-up-or-die crisis, and embarked on a reinvigorated solo career enriched by a survivor s wisdom. In his autobiography, Hughes talks us through this whirlwind of a life with unflinching honesty and good humour, taking us right up to date with his triumphant re-emergence in current super-group Black Country Communion. Glenn Hughes is a true original whose music blends hard rock, soul, and funk. Once described by Stevie Wonder as his favourite white singer, he achieved international fame with Deep Purple, and has since collaborated with artists including Tony Iommi, The KLF, and members of The Red Hot Chili Peppers. He formed his new group, Black Country Communion, in 2010. Joel McIver is the bestselling author of Justice for All: The Truth About Metallica, which has been translated into 9 languages, and several other books. He has written for Rolling Stone, The Guardian, Metal Hammer, Classic Rock, and he is the occasional guest on BBC. Classic Rock magazine has called him "by some distance Britain's most prolific hard rock/metal author." He wrote the official biography of the world's biggest death metal band, Cannibal Corpse and co-wrote Megadeath's bio from bass player David Ellefson. 4.0 out of 5 starsGlenn's story follows a regrettably familiar path but is redeemed in the end. Effing rock star bios. After you've read enough of them, the booze-n-cocaine tailspin tales get predictable and redundant. While Glenn's book chronicles a criminal amount of wasted (in the truest sense of the word) years, it is ultimately redeemed by the author's triumph over indulgence in its latter pages. Hughes' accounts of his early years in Trapeze and Deep Purple, meanwhile, are an inspiring portrayal (described in his own refreshingly frank tone of voice) of a young talent in flower and a great snapshot of the times (the 1970s). Although Glenn was a prisoner to his addictions by the time the 1980s hit, he still managed some remarkable music in that decade; namely the underrated Hughes/Thrall project, the Black Sabbath album Seventh Star and his work with guitar legend Gary Moore. His perspective on those musical events is captivating for fans like me (who are amazed that Glenn Hughes hasn't attained household-name-status considering his prodigious talents). The triumph of sobriety and Black Country Communion make for a satisfying end to this tome, which is filled not just with cautionary tales but loads of the kind of highly colourful anecdotes that could only be told by a career rock star. Throughout the book, Hughes displays great humility and grace, always offering praise for the musicians he's worked with along the way (his enduring friendship with David Coverdale over all these years is particularly poignant). If you're a fan of this relatively unheralded talent, you'll finish this book within a few days. Enjoy. 3.0 out of 5 starsThe story of Hughes’ rise to fame, descent into total drug addiction and eventual recovery. Description: Glen Hughes joined the English rock band Deep Purple when they were at their peak. He was a highly talented singer, songwriter and bassist and had previously spent six years in the band Trapeze, but as part of Deep Purple he immediately achieved worldwide fame. After two years Deep Purple split up and Hughes then went on to make a lot of music with a string of bands and as a solo artist, in addition to being a session musician on a long list of recordings by other artists. The book tells the story of Hughes musical career and his relationships with many people in the music industry, both famous and not so famous. It also describes in some detail the lurid lifestyles led by many successful people in the industry. But the main focus on the book is on his introduction to drugs, his subsequent addiction, his chaotic descent into a personal (and professional) hell, and his eventual return to sobriety and relative normality. He pulls no punches in describing what it is like to be a drug addict and the impact it had on himself and all those around him. The book is liberally laced with quotes from a great range of people who have come into contact with Hughes throughout his life and career. John’s thoughts: I loved (and still do love) a lot Deep Purple’s music, so I was a very happy camper when Shellie presented me with this book. I read with great interest the content relating to music, musicians and bands. It was interesting to read about who he interacted with and to find out more about some key people in the music scene. What wasn’t so interesting was the drug-related content. I soon tired of reading about drug dealers, users, addicts and the impact of addiction. It is obviously important content, and telling that story is no doubt one of the big reasons why Hughes created this book, but reading about someone totally screwing up their lives and often being a jerk while doing it just isn’t a lot of fun. Plaudits to Hughes for finally getting his act together, getting clean and recreating his life, and I admire his brutal honesty in telling the tale. I just lost a bit of interest half way through the book. It didn’t help that the autobiography wasn’t very well put together. It jumped around a lot and contained loads of snippets that just seemed to be patched together. Things didn’t really flow smoothly. I’d recommend this book for any big fans of Deep Purple or Hughes’ other music, and it would also be a good read for anyone wanting to learn more about the perils of drug use and the travails of an addict. Unfortunately it left me a little cold. I’d rate this book 2.5 stars. If you mention the band, Deep Purple, to any baby boomer, you will likely hear instant mouth-generated riffs of some of their huge hits like Hush, Smoke On The Water, Space Truckin', Burn and many, many more. One of the most flamboyant and remarkable members of the band was bass player, Glenn Hughes, who joined the band in 1973, making up what is referred to as the "Mark III" and "Mark IV" band line-ups. To be sure, Hughes made his first mark with his band, Trapeze, but his first huge success happened when he joined Deep Purple. Hughes went on to work with many great artists and bands, as well as doing his own solo work, and is currently thumpin' the bass with the super group, Black Country Communion. I don't want to ruin any surprises in the book but I will say that Mr. Hughes is pretty darn lucky to be alive. I wasn't surprised by the drug use. I was surprised by extent of his addictions and the distance of his fall. That all said, Hughes tells his entire story, warts and all, from the vantage point of one who has finally come to grips with his disease and knows his life of sobriety is a rare second chance at life. It's obvious that he's now living life to its real fullest, with the love of life, Gabi, and the renewed passion he has for writing and making music. No, he can't recover what he has lost in the areas of time and money but that only fuels the intensity to make every moment of every new day count. And, while I'm a huge fan of his work and love the stories behind the music, my biggest take-away is the insight Glenn Hughes provides by baring his soul regarding his disease and his sobriety. One interesting thing about this book besides the incredible stories: All the photos provided are in the front of the book instead of in the middle or scattered throughout. I'm not saying that it's better or worse that way - just interesting. Glenn Hughes: the Autobiography isn't just a must-have book for the rock music fan, it's a must-have book for anyone who wrestles - no, make that "battles" - with addictive demons.